The ISO 5500X family of standards on Asset Management defines asset management as those activities that enable an organisation to realise value from assets in the achievement of its organisational objectives. Therefore, the emerging guidance is that asset management decisions must be 'value driven' and not 'cost focussed' as they traditionally were. The aim of this project is to develop a structured methodology to help infrastructure managers develop asset management plans that can ensure that the asset continue to provide the best value for money. This is achieved through a systematic approach that identifies the key stakeholders of the assets (e.g., asset owners, maintenance contractor and the end users), their needs and requirements from the asset, and how these requirements are fulfilled by the effective maintenance policies adopted through the asset life cycle. 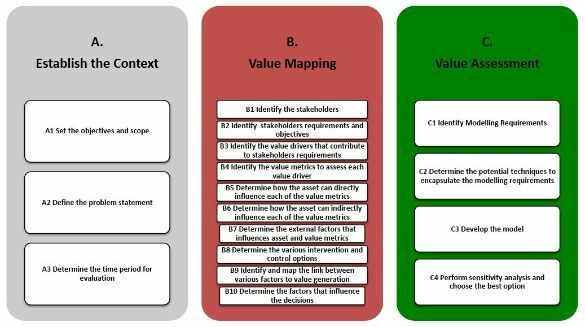 The main enabler for the new methodology is the “Value Mapping Tool” that facilitates easy visualisation of key value elements. The tool provides information regarding the key factors that influence the value provided by the asset and also the levers that the asset managers can pull to manage or control the value. Such a value map will also help asset managers to devise maintenance policies by taking into account the various possibilities and evaluate the best value. The value mapping tool will be supported by mathematical modelling techniques to determine through-life costs, risks and performance of the assets. This will help the asset management program to maximise the value to the various stakeholders at the best possible minimum cost. A key benefit of this approach is that it forces asset managers to think systematically about the different ways by which asset value can be managed, and also will highlight the important bits of information that is necessary to manage the asset. The value-driven decision process consists of three stages. The figure below illustrates the various steps involved in the three stages to implement whole-life value process. Stage A: Establish the context. Given the nature of infrastructure organisations and their associated variety of assets, it is important to determine the context for the initiative. The asset management decisions widely wary depending on the type of asset, functionality and the wide ranging problems that needs to be addressed. For example, strategic asset management decisions will involve developing whole life valuation for a portfolio of assets to satisfy regulatory compliance. On the other hand, daily operational decisions may involve determining the optimal intervention type for a particular asset. Therefore, it is essential to establish the context and needs. Stage B: Develop the value map. This stage determines the key value drivers and also establishes the value creation process. Each infrastructure asset and the dependent system generate value by providing the necessary functionality. Consequently, any failure or disruption will have an impact on the value created. This stage helps in understanding the value and the impending risks contributed by the asset towards various stakeholders' requirements. This stage helps in understanding the value and the impending risks contributed by the asset towards various stakeholders requirements. The output of this stage, which is in the form of a value map can aid asset owners in better understanding of the dependencies that need to be considered for a particular asset when making asset management decisions. Additionally, the value map can also inform organisations to understand the information requirements for asset management decision making. Furthermore, the value map can be used to develop innovative ways for managing assets such as enhancing inspection reports for information gathering purpose, which in turn can be used for learning and modelling of asset deterioration. Stage C: Assess the value. This stage is dedicated to developing an appropriate decision model and calculating the value of the asset and assessing the impact of different decision options on the value generated. This will help the decision maker to choose the best decision that maximises value. The value assessment will depend on the scope and objective of the study. This can include evaluation of options or in determining the optimal intervention type and timing or in prioritising the work schemes based on value. The quantification of value and the impact of decisions on the value will be modelled in this stage. The appropriate elements to model will be obtained from the previous stage. Srinivasan, R., Parlikad, A.K., "An approach to value based infrastructure asset management," Infrastructure Asset Management, 2017. Srinivasan, R., Parlikad, A.K., Whole-Life Value Based Decision Making in Asset Management, Thomas Telford Publishing, ISBN: 9780727760616, 2016. Srinivasan, R., Parlikad, A.K., “A Process for Value Based Asset Management Decision Making,” In Proc. 10th World Congress on Engineering Asset Management, Tampere, Oct 2015. Roda, I., Parlikad, A.K., Macchi, M., Garetti, M., “A Framework for implementing value-based approach in Asset Management,” In Proc. 10th World Congress on Engineering Asset Management, Tampere, Oct 2015. Rezvani, A., Srinivasan, R., Farhan, F., Parlikad, A.K., Jafari, M., “Towards Value-based Maintenance,” In Proc. World Congress on Engineering Asset Management, Athens, Sept 2009.